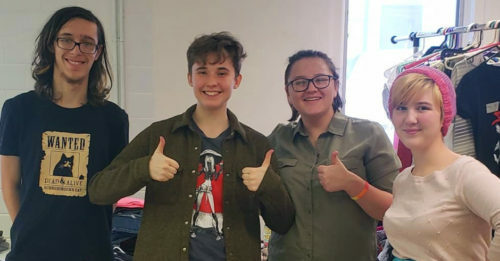 Nick Johnson, a 16-year-old student at a charter school in Indiana, overheard another trans masculine student at their school complain about their lack of male clothing. Johnson reached out to another student, and they hatched a plan: the Rainbow Jacket Project. “Even if it didn’t, though, we would still do it, because it’s something that means a lot to both of us,” Johnson added. Getting clothing can still be a challenge for those who may be exploring their gender. Some may lack adequate funds or may feel uncomfortable shopping in a different gendered section from how they are currently presenting. The goal is to provide a space where people can feel safe and comfortable building a wardrobe. To house the Rainbow Jacket Project, Johnson and Lang reached out to an unlikely source: St. Paul’s Episcopal Church, asking if they would be willing to provide a space. The project currently uses the church’s annex, at 314 Southeast Riverside Drive, in Evansville, Indiana. As word has spread, so have the number of donations coming into the project. “At first we collected stuff from friends and family,” said Johnson. “As word spread about the project, we got many more donations coming in. The marching band at Castle High School did a clothing drive for us where they all played tag and brought in clothes. “It’s wonderful to see how the community is coming together to support us,” added Johnson. The Rainbow Jacket Project just held its opening day, which featured a steady stream of people both picking out attire for themselves as well as people dropping off donations. “It was really satisfying to see how our hard work has paid off,” Johnson said. The project has become so big, in fact, that they’re having to ask that donations be dropped off only during their operating hours, and are seeking additional adult volunteers to assist with the project. The project is now in discussions with Queer Spaces, another local group, about being able to access their 501c3, which would allow the Rainbow Jacket Project to receive monetary donations and seek grant money. “We want to help bring trans, queer, and gender non-conforming youth in Evansville together and to let them know that there are others like them, that there are people who want to help,” said Johnson. You can learn more about the Rainbow Jacket Project, and how you can help, on their website. Opening day was a success! Thank you everyone for all the wonderful support! Our goal was to bring a community together, and it seems that’s exactly what’s happening. We’ll post with our next dates soon, so keep your eyes out!